Kent Goulet is an admirable man, who leads an active life after being confined to a wheelchair. 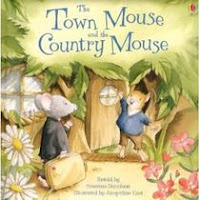 In this episode he discusses the moral of The Town Mouse and The Country Mouse - one of Aesop's Well-known fables - and how it helps him to cope with his disabilities. The message of this fable is that it is better to have enough of what we need and to live happily rather than have everything we want and live constantly in fear of losing it. This is one of Aesop's well-known fables, whose moral is that it is better to have enough of what we need and to live happily rather than have everything we want and live constantly in fear of losing it. If you watch the episode of my interview with Kent Goulet, you will see how it helped him to cope with the disability of being confined to a wheel chair after a dreadful accident.Kent Goulet is an admirable man, who leads an active life after being confined to a wheelchair. In this episode he discusses the moral of The Town Mouse and The Country Mouse - one of Aesop's Well-known fables - and how it helps him to cope with his disabilities. His message is that it is better to have enough of what we need and to live happily rather than have everything we want and live constantly in fear of losing it.